Doctors hold one of the newborn triplet of Yojaimi Garcia, 20, as she undergoes a caesarean section procedure. Yoli Cabeza was sent from one hospital to another before finally giving birth to her daughter Yusmari in the corridor of a maternity ward because her contractions came quicker than medical help. The 37-year-old was diagnosed with a high-risk pregnancy but that didn't spare her from Venezuela's medical "roulette" -- the practice of referring patients from hospital to hospital due to a lack of personnel, supplies or sanitary conditions. Cabeza told AFP she "did the tour of every hospital in" Ciudad Guyana, the biggest town in the state of Bolivar, before returning to the place she started at, the Negra Hipolita maternity unit where "they took me in." Incredibly, her case isn't rare in a country where many women are forced to give birth in the street because they can't get into a state medical facility. At the beginning of November, a woman was filmed giving birth to her son squatting by a tree in front of the biggest hospital in Bolivar. Venezuela is in the midst of an economic meltdown triggered by mismanagement and a slump in oil prices followed by US sanctions. The United Nations says some 2.3 million people have fled Venezuela since 2015 and amongst them have been many doctors. According to a study by a dozen non-profits, some 22,000 doctors, more than half the former total, emigrated between 2012 and 2017. Added to that, more than 6,000 nurses (74 per cent of that industry's workforce) and 6,600 lab technicians have left while there's a shortage of 90 per cent of necessary medicines and supplies. Often, patients are turned away "because there are no surgical materials, no anesthesiologists. 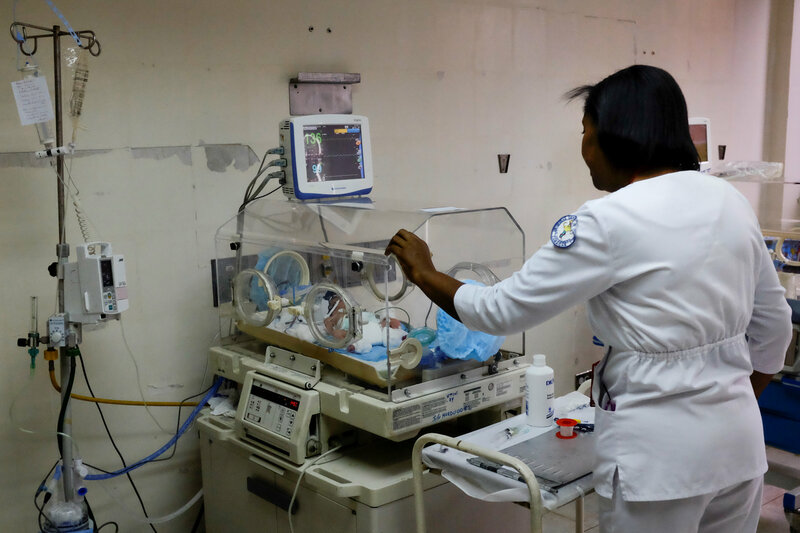 They don't even have chlorine to clean the cubicles," said Silvia Bolivar, a nurse at Concepcion Palacios, the biggest maternity unit in the capital Caracas. Pregnant women are sometimes expected to bring their own disinfectant and garbage bags. Venezuela has been suffering from four years of recession in which poverty is on the rise as food has become short in supply. A caesarean section kit costs the equivalent of $100 (S$137.50) at the black market rate while the minimum wage is 1,800 bolivars (S$8.30) a month. Inflation, which the International Monetary Fund predicts will reach 1.35 million per cent this year has crippled the currency as United States sanctions saw foreign investment dry up. The effect on pregnant women has been devastating. Yusmari Vargas, 24, was suffering from preeclampsia, a condition marked by high blood pressure that can develop into a more serious one that puts both the mother and baby's lives at risk. When she arrived at the maternity unit, it was closed. The hours passed, the contractions became stronger and her baby ended up on the floor, welcomed into the world with a bump to its head. "When he fell, they didn't even help me pick him up, there was nothing to cut the umbilical cord. It was a mess," she said. Carolina Rojas, 22, almost lost her daughter after her caesarian section was postponed several times. "One day there was no specialist, the next the pediatrician or the anesthesiologist didn't turn up," said Rojas. Her daughter swallowed amniotic fluid and spent eight days in hospital after she was born. Infant mortality rose 30 per cent in 2016, with the deaths of 11,466 babies up to a year old, according to the latest Health Ministry figures. Despite refusing to acknowledge the country's public health problems, President Nicolas Maduro launched a programme to reduce the number of caesarian section births, but a year later he admitted it hadn't provided the expected results. Suffering from post-natal pain, 32-year-old Yohanni Guarayote forced her way into the Negra Hipolita maternity unit, which locks its doors at night due to crime in the area. She was only able to have two prenatal check-ups because she couldn't pay for a private clinic as her husband is unemployed. "Some days the doctor didn't turn up, others there was no water, and so on," she said. Her arms are so thin they look like a child's. During the pregnancy, she barely reached 43 kilograms (95 pounds), eating mostly sardines, yucca and squash. "Now, I'm like a stick," she said, reclining in a sweltering room with six beds but no sheets. She receives government subsidies but with another three children to feed, she says it's "not enough." "This year has been terrible for pregnant women. They need to show more love to motherhood."